The state of our union is not strong. It’s far weaker than you’re willing to admit. 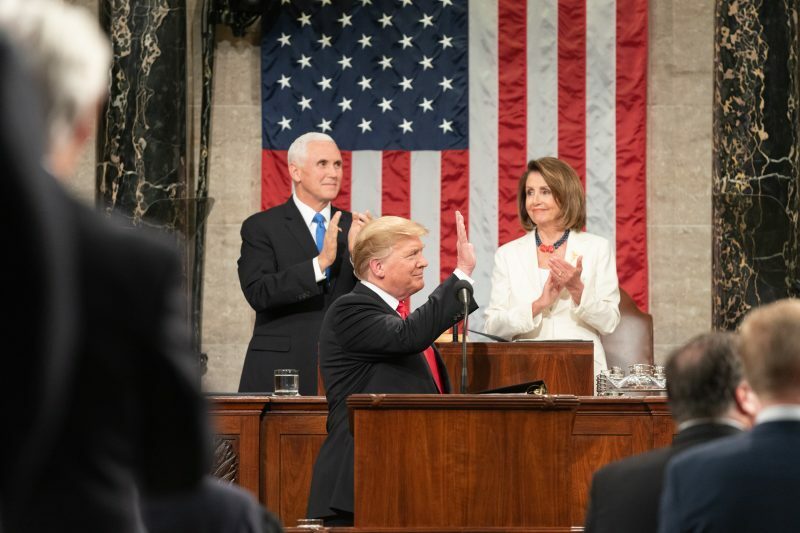 President Donald Trump gave his second State of the Union Address Feb. 5, during which he addressed topics ranging from national security to women’s impressive growth in the workforce. Trump emphasized the flourishing U.S. economy to open his speech. I was surprised to see that the unemployment rate has decreased — especially within minority communities — while wages for American workers have increased. Aside from his ill-mannered jab at Obamacare, I was shocked by the Trump administration’s economic advancements. My astonishment, however, was short-lived. Not even a quarter of the way through his address, Trump threw shots at special counsel Robert Mueller and the Russian investigation, calling it a “ridiculous” and “partisan.” Trump is the epitome of contradiction — asking for bipartisanship, then slandering both sides of the aisle in defense of himself. It baffles me that our government can be divided to a point where the FBI can investigate the president for colluding with a foreign country that is infamous for causing tension with the U.S. Having a president under investigation creates discomfort for everyone. We saw it with Nixon, with Clinton and now with Trump. So, Mr. President, when you said you would “drain the swamp,” I hope that didn’t mean replacing American legislators with Putin’s finest. When Trump masked his ignorant, offensive comments with flowery and ambiguous rhetoric, my only reaction was to laugh out of shock. He generalized Mexicans as “ruthless coyotes, cartels, drug dealers and human traffickers.” It wouldn’t be a Trump speech without mentioning of illegal immigration and his infamous wall. President Trump, Latin American immigrants are people — same as you and I. You described it yourself in your address — these people are risking their lives, at peril of being raped, robbed, beaten and even murdered. They aren’t leaving their home countries, they’re escaping. “Year after year, countless Americans are murdered by criminal illegal aliens,” Trump claimed during the speech. In reality, undocumented immigrants commit less crimes than native-born Americans. According to data compiled by the Cato Institute, undocumented immigrants had 56 percent fewer convictions respective to their population than native-born Americans in Texas in 2015. This data completely contrasts Trump’s claim. Crime is a widespread dilemma. Instead of investing billions of dollars into a border wall and shutting the government down, Trump should focus on enhancing the training and increasing the wages of American domestic officers, military personnel and government workers — the people who protect us everyday. The 2019 State of the Union Address wasn’t all bad. Facial expressions from Democrats throughout the night were priceless. The Democrats sat with looks that resembled discontent, annoyance and, sometimes, amusement. From Senate Minority Leader Chuck Schumer’s comical commentary to 2020 Californian and Democratic presidential candidate Sen. Kamala Harris’ transparent annoyance. I respected the Democrats on Tuesday. It takes a lot of discipline to sit through a speech full of insinuations, distorted realities and fallacious narratives. Democratic women stood up and let out an uproar of appreciation for the recognition. The scene was so heartwarming, it was hard not to smile. Even Trump was surprised by their applause, commenting, “You weren’t supposed to do that,” with a grin on his face. This is the year of women. There are 102 women in the House of Representatives and 21 in the Senate. We are taking power in leadership positions and influencing legislation. Nothing was more precious than Rep. Ilhan Omar’s, D-Minn., little shimmy dance in the back with her red, white and blue outfit. Regardless of these charming scenes, the fact of the matter still stands: our Congress is divided, therefore, America is still divided. No amount of humorous reactions turned into memes or well-deserved acknowledgment of women taking seats at the table negates this. 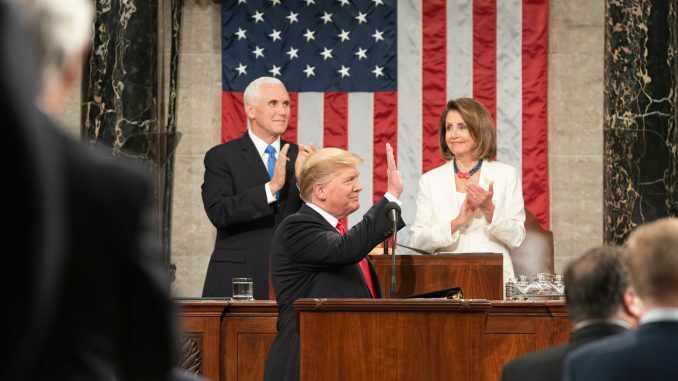 This address to Congress and the American people might have satisfied his presidential obligations, but Trump has a long way to go to bring the country back together. Mr. President, the state of our union is not strong.